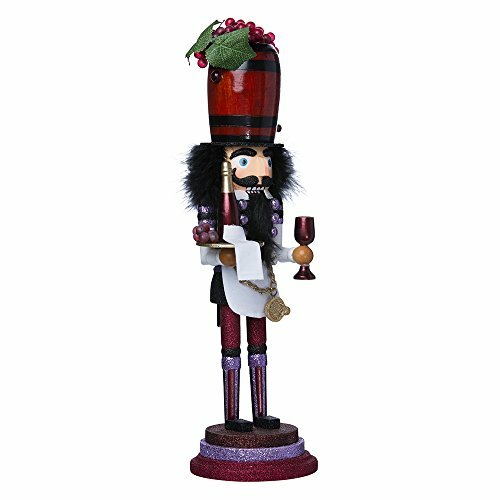 This Kurt Adler 19" Hollywood Wine Nutcracker is a fun, festive way to add to your holiday décor or nutcracker collection! Designed by renowned artist Holly Adler, Hollywood Nutcrackers is a whimsical collection of nutcrackers created exclusively for Kurt S. Adler, Inc. and features an assortment of characters including Christmas, fantasy and everyday nutcrackers. Their designs put a unique, vibrant, memorable twist on traditional nutcrackers. Like all Hollywood Nutcrackers, this nutcracker represents Christmas in a unique, glittery way. Perfect for wine lovers, his hat is a wine barrel topped with realistic purple grapes; his outfit has a wine-colored theme, with shades of purple, red, gold, and black. He is holding in one hand a serving tray with purple grapes, a bottle of red wine, and a napkin, and in the other hand he is holding a purple wine glass. If you have any questions about this product by Hollywood Nutcrackers, contact us by completing and submitting the form below. If you are looking for a specif part number, please include it with your message.